Condenser sets combine on one platform a compressor and a condenser. The compressor is the system pump and the condenser converts the compressed gas to a liquid. The compressor is located between the evaporator plate and the condenser. For the condenser to change the state of the refrigerant gas to a liquid, the gas from the evaporator plate must be compressed to a level that causes condensation in the condenser. The energy required to compress the gas comes from the compressor motor which draws power from the battery system. The pressure required is directly proportional to the condenser temperature. Higher pressure causes more work for the compressor which is why a more efficient condenser will save energy. The condenser takes the high pressure vapor from the compressor and cools the gas to the point where it changes state to a liquid. In other words, energy taken from the refrigeration box is transferred to the water or air in contact with the condenser. The choice is predominately air cooled or water cooled. Water cooled comes in two variants—a pumped water system or keel-cooled system. In marine and land mobile application, the compressor and condenser are typically mounted together as an assembly called a condenser set. They are precharged with gas and ready to connect to an evaporator plate. Each enclosure has a dedicated condenser set and evaporator plate. Condenser sets have capacity ratings expressed in BTU’s per hour. The ratings will vary according to evaporator plate temperature, condensing temperature and compressor RPM. 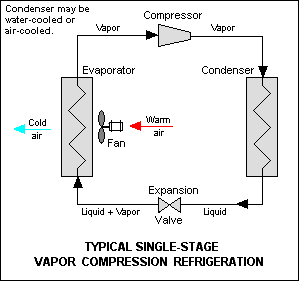 Please refer to the Refrigeration Cycle Wiki for a good overview of how a refrigeration system works. An air-cooled condenser cools the compressed refrigerant gas by use of a fan that blows ambient air across a finned condenser. They are the obvious choice for land based systems. An advantage for boats is their inherent simplicity and their ability to maintain refrigeration when the boat is dry. It is important to ensure cool air flow through the condenser—look for shrouded condensers with a plenum for connection of an air duct to direct the heated air away from the area where the condenser set is located. For vessels with larger box loads, water-cooling offers higher capacity and better efficiency. A DC powered pump transfers "cool" water through a tube-in-tube condenser. The water will take on heat as it passes through the condenser - getting warmer in the process. Up to three condenser sets can be driven by one common filter and pump. System capacity is up to 30% higher than air-cooled compressors. Water can be used from many sources. The most common source for boats is sea water however a filter will be required to protect the pump from debris. Water can be directly circulated from a drinking water tank provided that the design will limit the temperature rise of water in the tank. Keel-cooling is a unique form of water-cooled system. Instead of the condenser being mounted at the compressor and cooled by pumped water, the keel-cooler is in direct contact with the sea water. It is the most reliable of all systems. The only moving part is the compressor. It has similar performance to conventional water-cooled systems without the maintenance overhead of filter cleaning.